Local economies—whether large metropolitan areas, smaller cities and towns, or rural areas—also depend on exports to support growth and well-paying jobs. Since 2010, the Brookings Export Monitor has estimated goods and services exports as part of a Global Cities Initiative, which seeks to strengthen the international competitiveness and connections of cities and metro areas. In this latest installment, we examine recent exporting trends across the country as well as take a deeper dive into the connection between politics and national trade policy; in particular, we analyze how local economies are implicated in the recent round of Chinese tariffs on U.S. exports. To view or download export data at the county, metro, state, or national level, please click here. In 2017, the U.S. economy exported nearly $2 trillion in goods and services, which accounted for 10.3 percent of GDP and supported 12.7 million total jobs or 8.4 percent of U.S. employment. Exports increased by 2.3 percent from 2016 to 2017, slightly below overall GDP growth of 2.4 percent. The country’s 2017 export intensity has still not surpassed its peak of 11.8 percent of GDP in 2011 but is higher than it was in 2003 (7.9 percent). Oil and gas and manufacturing exports accounted for most of U.S. export growth in 2017, which reflects a bounce back from a poor manufacturing year in 2016. At a regional level, the South grew exports at the fastest clip (4.7 percent) relative to the West (0.7 percent), Midwest (0.8 percent), and Northeast (1.6 percent). Exports of oil and gas and manufacturing products primarily drove southern export growth, accounting for $13 billion and $12 billion, respectively. Incredibly, exports in these sectors from the South alone accounted for 58 percent of the nation’s export growth. Table 1 illustrates how the industrial structure of communities aligns with voting patterns in the most recent presidential elections. 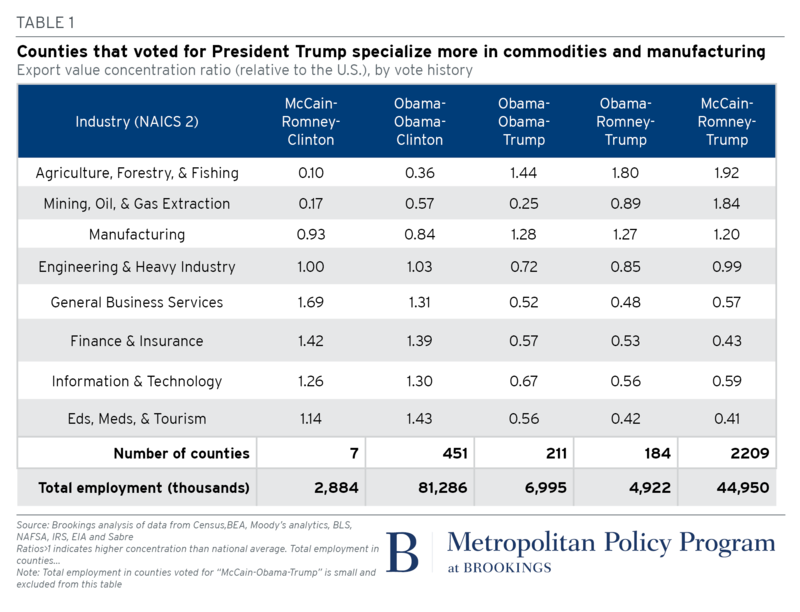 Republican voters, in general, are much more likely to live in counties that specialize in commodities and manufacturing, while Obama and Clinton voters are much more likely to live in counties specializing in services. Trump swing counties—meaning those counties that voted for President Obama in 2008 and 2012, and then flipped to President Trump in 2016—have a 44 and 28 percent higher export concentration in agriculture and manufacturing, respectively, than the nation as a whole. These sectors were more exposed to trade competition than advanced services such as finance, tech, and education and medical services. Moreover, Trump swing counties happen to host industries most severely harmed by the last 40 years of unfavorable exchange rates for exporters and offshoring (issues that he directly acknowledged during his campaign). U.S.-China trade war: Which communities are on the front lines? To extend that analysis, we converted the 234 products to four-digit NAICS industry definitions and examined the share of overall U.S. exports in tariff-affected commodities among each four-digit industry going to China. 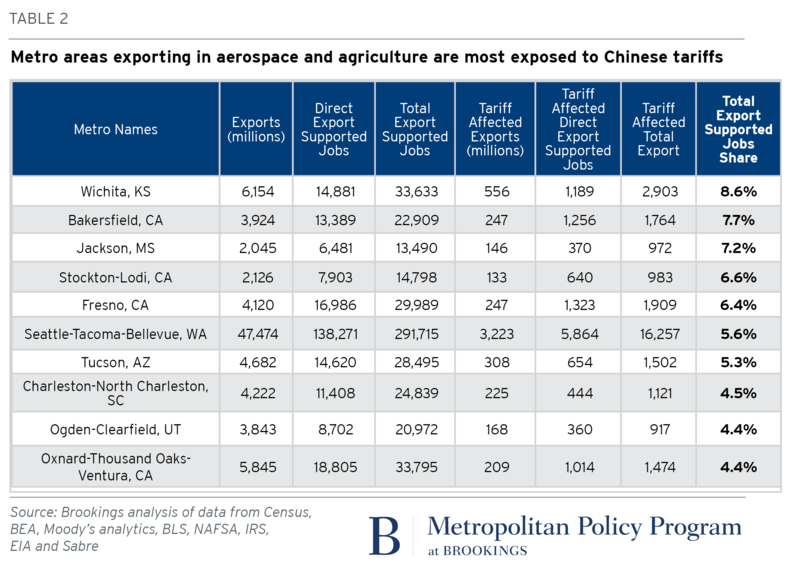 For instance, aircraft were included in China’s tariff list, so we estimated the share of total U.S. aircraft exports that go to China using national trade data. We then assigned that national ratio to each U.S. county. This analysis of metro-level exports comes at a time of great trade policy uncertainty. Currently, the relatively short product list means that the impact of the U.S.-China imbroglio is not yet widespread enough to inflict significant economic damage. 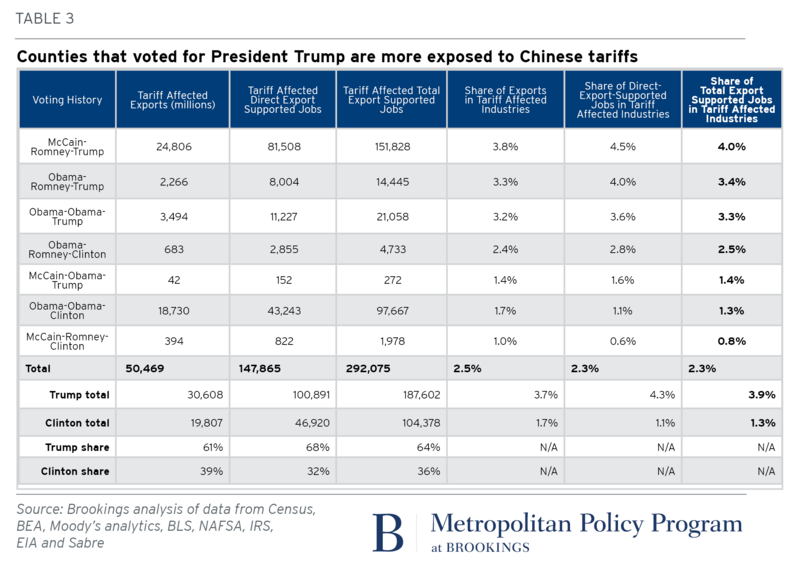 Yet, our analysis suggests that the result of the Trump administration’s tariffs on China are countervailing measures by the Chinese that would disproportionately target the export base of communities that elected the president. While not yet a full-fledged trade war, the rumblings between the world’s two largest economies is yet another signal of a new era in U.S. trade policy, one that local and state leaders ought to be watching closely. The authors thank Max Bouchet and Sifan Liu for research assistance.